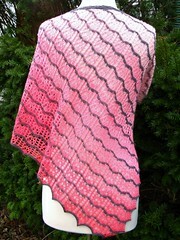 We’ve been given permission to put our Challenge #1 patterns for The Fiber Factor on Ravelry! Obviously this is just a placeholder for now — the pattern isn’t available for purchase just yet. Skacel has exclusive rights for a while, but when rights revert to me I will publish on Ravelry. If you’d like a PM when the pattern does become available (either through Skacel or, later, through Remily Knits), please leave a comment on the pattern page. P.S. Challenge #2 details will be out an 9am Pacific time — the video will go up on the Challenge #2 page at the same time that the competitors get the information. Very nice Rachel. And a nice project for an advanced beginner or one willing to learn new skills. It puts me in mind of a sampler type of stitch work that a young girl would do to show off her skills and different stitches. Thanks so much! A sampler is exactly the idea I had in mind … that natural progression of learning a skill.